I wasn't surprised to see pouring rain when I woke up this morning. All the same I was very disappointed. I'd held out hope that the weather reports would be wrong and that the storm would miss Long Island. No such luck. My issue with running in the rain comes from wearing glasses. A light rain is really no problem, it's sort of like driving through mist. But when the rain starts to come down hard it's windshield wiper time. 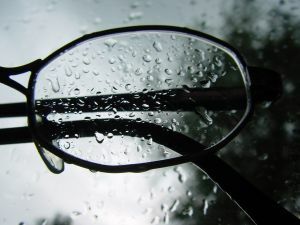 Since my glasses don't have wipers, running through rain can be very disorienting. I'm surprised there isn't some rain protection invention for runners who wear glasses. I guess corrective goggles or using contact lenses would be my only choices. Neither option is too appealing. The weather reports are indicating intermittent rain this afternoon so I may luck out for running later. I had hoped to run with a friend earlier this morning but it was just too wet at 6:00 AM. He and I are planning to try again next Sunday since I've decided not to do the RXR 10K race next weekend that would have conflicted with that. I may run one of the local 5K's taking place later in May or just skip this month for racing and focus on racing in June. There's the XTERRA Trail Series 8K at Stillwell on June 6 and the New Hyde Park 8K on the 13th. The Stillwell #2 race would be my toughest racing challenge to date. Stillwell #1, held this past March in the ice and snow, was very difficult even with the course cut down to 3.5 miles due to trail conditions. I ran New Hyde Park last year and struggled with pace, clocking in just under nine minutes per mile. I'll need to decide which to run in June. Maybe I'll run both. IF you AND IF I decide to run the NHP 8K, I'll look for you. NHP is were my +85 yr. old parents live. Maybe I can get them out to cheer me on. It has been MANY YRS. since they attend any of my sporting events. That would be great if they came out to cheer you on. Let me know if you decide to run it. I'm pretty sure I will.